We design and build trailers to suit the following: Quads (ATV's), Bikes (MX & Super), Jet Ski's, Boats, Cars, Golf Carts. Utility and custom-built trailers can be built to suit our customer's requirement providing that they lawfully comply with the National Road Traffic Act and the SABS requirements. Only high quality "A " grade steel is used and all components are SABS approved. The latest CO2 welding techniques are used during manufacturing. All trailers conform to SABS Specifications and are NATIS Registered. We participate and is actively involved in the quad and motorcycle sport and therefore understand the requirements needed and demands of quad and motorbike trailers. We build 1, 2 / 3 bike trailer with nose cone spare wheel and braking system. Was specially customized by us and is one of a kind. Trailer is in the brand new and excellent condition and is currently stored indoors. Harley Davidson, Ducati, Suzuki, Honda, BMW, KTM, Yamaha, Kawasaki, Vespa, Victory, Indian, classic, trike, golf cart, beach buggy, scooter, quad, quads, HOG, easy loader. Ideal for holidays and Africa Bike Week. 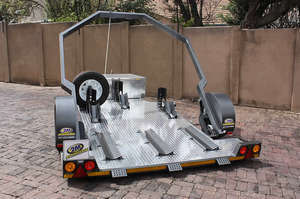 Call or text Ryan +27(0)839940307 or email for inquiring this trailer.